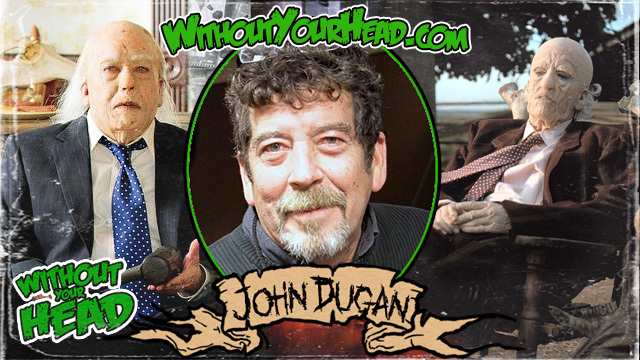 Please help horror icon John Dugan. A lot of you asked me about John Dugan recently. I didn't feel it was my place to say. But, now it is public. John has oral cancer which has spread and needed surgery and radiation treatment. John is more than just "Grandpa" of TCM, he is a dear friend of mine. He was one of the first people I met at my first horror convention, the first Days of the Dead, and we immediately hit it off. Anyone who has met him and talked to him knows what a good guy he really is. If you can help support John and his wife Stacy during this, it will be greatly appreciated. I know both of them hate asking for help, but sometimes we have to. They aren't asking for a lot, just enough to cover their bills while John recovers and Stacy is off work. Please help if you can, and share with other horror fans in our community. "As some of you may already know, a little over a month ago my husband John Dugan, who portrayed Grandpa in The Texas Chain Saw Massacre, was diagnosed with oral cancer, with a malignant tumor growing in the floor of his mouth. Initially it appeared it was going to be a routine resection with no further treatment outside of surgery needed. Unfortunately, a CT showed the tumor had embedded itself in his jaw, and had spread to one of his lymph nodes, making a more complicated surgery and radiation necessary. Friday July 27th, John had surgery to remove the tumor, part of his jaw, and his lymph nodes, and his fibula was used to reconstruct his jaw. The surgery was considered successful, and the goal was for him to be released last Wednesday. He was not discharged until Friday evening. Once we arrived home, within an hour his incision was bleeding, and we were heading back to the hospital, where they did a second surgery to open the incision and clean out a fistula and replace a tracheostomy that was not functioning properly, causing him to have trouble breathing. They are keeping him a few more days for observation and to treat him with IV antibiotics. The people I work for have been incredible, allowing me to take the time I need to stay with him in the hospital and eventually transition him home. However, I only started the job in February, so I only had a couple of PTO days, the rest have been unpaid leave. John and I are not ones to ask for financial assistance, even when things get rough. However, with close to two weeks being unpaid, possibly more depending on when they discharge him, we are asking our friends and horror family to help give us a boost with our living and medical expenses during these next few lean weeks. We love all of you, and any assistance, be it sharing this page or donating, will be greatly appreciated."